We're had some nasty weather over the last few days; in fact, its snowing right now as I type this post. The snowy conditions was the inspiration for this mani. Started with two coats of Spa Ritual Circle of Life and OPI Bride's Bouquet on accent finger; all two coats. Added Color Club Starry Temptress topcoat; one coat on most nails but two on the accent nail. Stamped with Konad white special polish using Big SdP K on thumb and assortment of snowflake images from XL K on rest of the fingers....except the pinky; on it, I used a couple of the snowflakes from the full size image from SdP K on it. I adore the snowflakes from XL K....a couple of these snowflake images are very cool! For the stamping accent finger, used the same Big SdP K design with Konad special blue polish. Added a few more of the smaller flakes from Big SdP K here and there to fill in some bare spots. Topcoat of SV to finish it off. I'm not looking forward to my commute to work in the morning due to the snow we're having right now....in fact, I'd say its the most we've had all at once all season....and it's suppose to turn to freezing rain in the early hours of the morning. Maybe I'll call in sick (cough, cough!!) lol! I'm not sure why it took me so long to use this image as it was one of my favourite images of the latest set of Shirley's plates that I received before Christmas. This pix was taken in my bathroom...while the lighting wasn't the best, you can see the accent polish and rhinestones a little better so I thought I'd include it! Started with two coats OPI Do You Lilac It? Added a couple accent nails of Fashion Bug Red Multi which I picked up at Fashion Bug during one of my past cross border trips to US; one coat. Stamped using Konad royal purple special polish using Big SdP M.
Added a few rhinestones on accent nail. Then filled in the wings of with the same accent stamping polish, Fashion Bug Red Multi. I also added some more rhinestones on my thumb for another dragonfly but wasn't really thrilled with it. I've used this image now a few times with different colour combinations...and am sure I will use it a few more when spring and summer finally arrives! Hope you're having a fantastic weekeend; thanks for looking! It seems that lately, my nail polish selections have been a little on the neutral or darker side...I'm thinking it's because of the blah weather we've been having lately....so I decided to brighten my day with China Glaze Sunshine Pop! Sunshine Pop is from the China Glaze Electropop collex....I picked up most of the collex at my local beauty supply shop; I don't think I've seen them at Sally's yet. This is two coats. I was pleasantly surprised to see how well the coverage was for a yellow; while it may have needed three coats, I generally leave at two as I know I'm going to be stamping over it and only wear my polish for a day or two anyway! I was happy to see the shimmer come out which hopefully you can see from these pix or perhaps click and enlarge...this was the greatest downfall of Chanel Mimosa; it looked beautiful in the bottle but lost its shimmer on the nail. I'm also wondering how close this is to Mimosa...I should have checked my bottle to see how close they are...I'm sure comparisons of the two will soon be popping up in the blogesphere soon anyway! Stamped with Big SdP N using white Konad special polish. Added some dots using other Konad special polishes. Then a few more dots, topped with SV (the pix below doesn't have SV but the very first one does) and voila! The brightest set of nails I've sported in a while! lol! In hindsight, I wouldn't say this is the most unique yellow polish I have...I'm wondering again how close it is to Chanel Mimosa...and it seems to be another colour that gives me the dreaded lobster hands....while I thought of putting this up for swap, I think this may be fun to wear during the summer! I'm sure my daughter will love to wear it during the summer too. It just seems kind of out of place with my winter wardrobe and the dull, dreary days we've been having...but with any luck, the sun will shine soon! Hope the sun is shining in your neck of the woods...and thx for looking! I almost forgot! I've been having trouble replying to comments on my blog and leaving comments on lots of blogs I follow for the last week or two...its kind of random...some blogs, I have no issue; other ones I can't...including my own. It happens on any computer I use, but I can leave comments if I view on my iphone...so if I regularly check out your blog and haven't been commenting...or if it seems I'm ignoring comments on my blog...I'm not! This is the reason...I just read yesterday another blogger having same troubles...so hopefully I'll be able to figure out the solution soon and rectify it! This is the mani I had on yesterday. Started with a base of Wet n Wild Black Creme and accent finger of Duri Taming of the Shrew. Added coat of Essie As Gold as it Gets. As I wanted the gold flakies to stand out, I decided to add a coat of Essie Matte About You. Really liked the end result on the accent nail; will have to keep this in mind for another mani! I applied Essie Gold About You on my middle finger first; unfortunately, it was really goopy and I applied it too thick, which can really be seen in this pix after it was mattified. Then stamped, using black Konad special polish and CND Gold Chrome using fauxnad m27. When I was looking through my plates, I was surprised that there were so many dragon images...but thought that this one was the most appropriate. 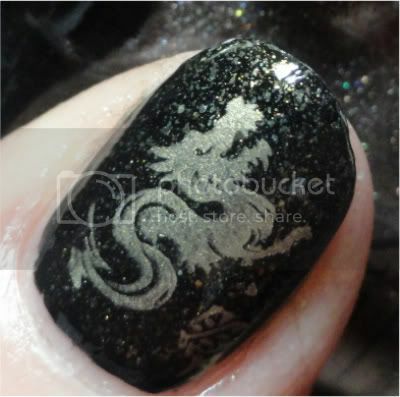 In hindsight, I think I should have stamped the images sideways like on the thumb as the dragon was too long for the width of my nails and I cut the tail off most of the images...some of the stamps kinda look like wolves now! lol! Added a few accent symbols...unfortunately, I don't know what they say so take them with a grain of salt! And that blob on the middle finger is suppose to be a fan; however, it didn't transfer too well. I couldn't remove it and redo as my nails were mattified. After looking at my mani for a bit, I decided that I ultimately wanted to add a topcoat so topped with a coat of SV. I'm glad I did because I liked the result better than left at matte. Thanks so much for making this happen! I never thought in a million years that a 1000 people would ever want to check out my little blog! Have a great New Year if you are celebrating today...and if not, I hope you enjoy my mani anyway! Edited to reflect that I forgot to add CND Gold Chrome polish. A couple more mani's from the archives...this first one is from early December 2011. I had just picked up Essie Bobbing for Baubles; this was two coats. I see this is another mani that gave me lobster hands...I love how KarenD coined the phrase "rosy glow" for lobster hands in the comments of my post a couple days ago.....rosy glow just sounds so much nicer! Then stamped with Big SdP F using China Glaze 2Nite. While this was pretty enough when I did it late at night...it really didn't reach its full potential until I was sitting in my car the next morning when I was out doing errands. I looked at my nails and bam! Hello, holo!...so I grabbed my camera quickly and snapped a few shots. Here's another holo mani...this time taken back on February 11, 2011...yikes, almost a year ago! Started with a base of Nubar Hollywood Pink. Then topped with one coat of OPI What's Dune? Lastly, stamped using Konad Gold Black Pearl special polish using fauxnad plate XL B. Hope you are having a fantastic weekend....and thanks for looking! I really liked the shimmer of Orly Nite Owl; I went through my stash after I wore it to see if I had another colour with the same or similar shimmer finish.....I shouldn't have been surprised to discover it was another Orly....Pixie Dust. I've had Pixie Dust for a couple years or more now. I can't believe it took me this long to wear it (althought it does seem to give me lobster hands judging by these pix; good thing that never makes or breaks a polish in my eyes!) This is two coats. Stamped using Big SdP A using white and black Konad special polishes. Added a few dots, SV and done! I got a lot of compliments on this when I was out and about....a comment I heard quite a bit was, is that 'those nail stickers'? I'm guessing no one was that familiar with stamping.....but, this may actually be a cool design for nail stickers, come to think of it! This is my NOTD...16 days after I shortened my nails on January 1st. Not long by any means, but enough length to no longer be classified as nubs...or at least what I think nubs is on me! Started with two coats of GOSH Gypsy Blue. Did an accent nail with one coat of Claire's Off to See the Wizard. Stamped using SdP 59 with pastel blue Konad special polish. I then isolated two of the flowers on the same image from this plate and stamped them on the accent nail using white Konad special polish. Added a few white dots. Lastly, added a couple blue dots in the centre of white flowers on the accent nail; topped with SV. Hey Canucks...Have You Been By Winners Lately?